How Can Rich Perlberg Walk Straight? Obama supporter thinks he can prevail in Michigan's 42nd district Republican Primary. And man parts the size of watermelons. U.S. Sen. Carl Levin, D-Detroit, has spent 30 years looking out for Michigan’s best interests in Washington. He has earned a sixth term. Michigan voters should re-elect CARL LEVIN. Yeah. THAT is a real example of a Republican endorsement. Not. Hensley lays out a history of his support for the liar in the white house, as well as a disconnect from reality he seems to enjoy. 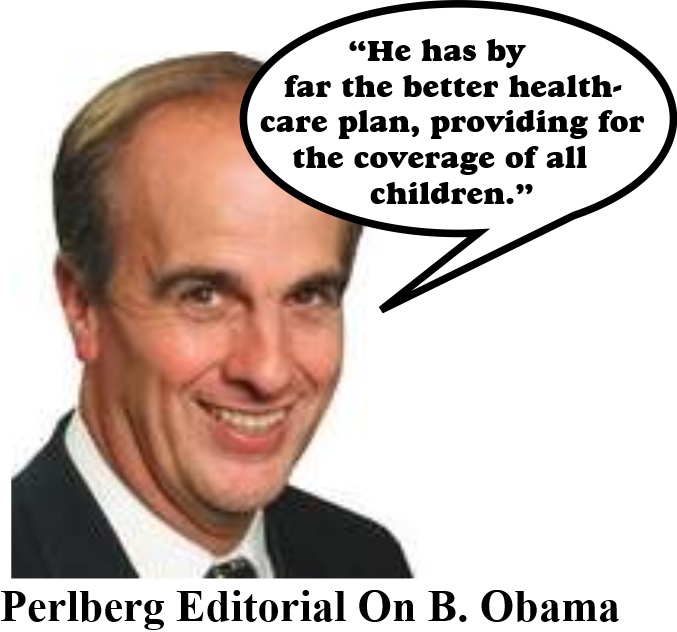 Perlberg hardly espoused even the most moderate Republican principles in his paper’s editorials, and it seems a disconnect that he could possibly represent Republicans properly in the legislature. Read the entire lot of them and laugh (or cry) at the ridiculous thought that the 42nd district might possibly elect this joker. Hmm, yeah, as much as I despise the use of the term (principally because of overuse), I do believe that the RINO label genuinely applies here -- pending verification otherwise. Honestly, I also apply the term to Governor Rick Snyder, based upon the investigative journalism done by Nick during the summer of 2009.